Have you been on the hunt for custom prints and event decor in Long Island to help you piece together a theme, concept or look for your next big event? It can be tricky to find all of the custom prints, graphics and event materials you need, which is why it’s a success when you can find one company that has all of your custom graphics needs. At Bombshell Graphics, we cater to your needs for event decor in Long Island. At Bombshell Graphics, we are all about putting together the event you picture in your mind. We want you to have the event you have been dreaming about. That’s why we put our hearts into the custom wedding dance floor graphics, custom dance floors, custom floor stickers, and wall graphics we create in Long Island. If you have been searching near and far for the perfect dance floor at venues for your wedding, then you should consider having Bombshell Graphics create your own custom wedding dance floor. We work to create all unique types of floor graphics and can match any theme or concept you have decided on for your wedding. Specializing in custom graphics, we can design elegant removable dance floor decals, vinyl floor stickers, and more! It is important to us that you have the specific look you have wanted for your big day, so let us help you dress your venue up according to your liking. Our custom wedding dance floors are the best addition you can make to your wedding. While not every event location or venue comes with a specific area for a dance floor in Long Island, Bombshell Graphics can certainly create the space with custom dance floor decals. No matter what type of event you are hosting, we can transform the room to go according to the appearance you want. We have created all types of custom dance floors from floral designs to funky patterns to floors with monograms and names to sports courts and more! 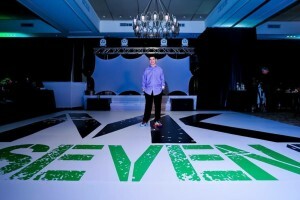 It is our goal to create the look of the custom dance floor decals you choose! The floor graphics created by Bombshell Graphics aren’t specific for just dance floors – we also do other varieties of custom floor stickers and floor graphics. If you want a specific design for a ballroom, letters marked on tiles in the room of the event, footprints leading to another room, or a marked pathway, then Bombshell Graphics can create the cool floor graphics you want! The sky’s the limit when it comes to the types of graphics that can be created by Bombshell Graphics. We also can make custom wall graphics and decals to help match your custom floor graphics or emphasize the theme of your event! When it comes to different styles, colors, patterns, and designs for custom wall graphics in Long Island, Bombshell Graphics has the most versatile creations. If you have a specific idea in mind, let us know and we can make it happen. For all of your needs regarding custom prints and floor stickers for events, turn to Bombshell Graphics. Regardless of the type of event, you are having, we want to come in and transform your venue to match the ideas you had in mind! It is our mission to provide high-quality product that aids in the process of bringing your vision to attainment. 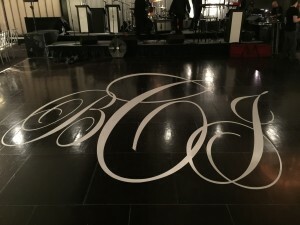 To have the greatest custom dance floor graphics, wedding floor decals, and custom wall graphics in Long Island at your special event, reach out to Bombshell Graphics today!